Comentatorii locali tind să jubileze la veștile proaste din America de Sud și la înfrîngerea stângii de acolo. Venezuela e exemplul cel mai clar, tocmai datorită militantismului Chavismului, dar și a dimensiunii crizei. Îndreptăm atenția mai jos spre două analize ce caută să facă mai transparentă economia politică din spatele crizei venezuelene, în contrapondere, așadar, cu verdictele deja cunoscute din presa mainstream (corupție, eșecul socialismului, etc.) Ceea ce se întrevede, în schimb, este confluența dintre o criză sistemică a statelor exportatoare de petrol și speculațiile făcute de capitaliștii locali în vederea acumulării. How Bad is Venezuela’s Economic Situation? enezuela’s central bank just did something totally unexpected: it released updated economic figures showing the country has sunk into its worst economic crisis in decades. Data this detailed hasn’t been published by the BCV in over a year, and it makes for grim reading. Few Venezuelans would be surprised to hear the economy isn’t doing well, but the new figures released by the Central Bank of Venezuela (BCV) on January 15 still felt like a punch in the gut. Annual inflation hit 141.5 percent in 2015 – double the 2014 rate, and easily the worst in the world. High inflation is nothing unusual in Venezuela. Yet since 1999, Chavismo has done a relatively reasonable job of keeping inflation well below crisis levels. However, the new figures also show Gross Domestic Product (GDP) has nosedived, sinking 7.1 percent by third quarter 2015. Growth isn’t everything, especially in an economy aiming to transition away from capitalism. Yet these numbers are extreme. Moreover, the devil is in the details. In its breakdown by sector, the Central Bank of Venezuela’s (BCV) report indicated food costs are among the biggest drivers of inflation. Venezuelan consumers saw the cost of food lurch upwards by 55.7 percent in the third quarter. Overall, food costs rose a whopping 254.3 percent in 2015 – a figure that easily surpasses wage increases by any measure. Increases of basic food costs disproportionately impact the poor, who typically spend a larger chunk of their income on necessities like staple foods. However, the BCV’s numbers also show the state apparatus as a whole is also bearing a heavy load. One of the most telling figures was to be found in the bank’s current account data, which showed a US$782 million trade deficit for the 2015 third quarter. This is particularly concerning, as those numbers are from a time in 2015 when Venezuelan oil was fetching an average price of more than US$40 a barrel. Today, Venezuelan oil is selling for something closer to an average of US$25. In other words, the trade deficit figures are likely already worse, with no signs of a quick recovery. It’s important to note this isn’t the whole picture. Firstly, while the economy as a whole is witnessing a serious downturn, the poverty figures we have available don’t look too bad. On the contrary, the latest official statistics (released in mid January) suggest extreme poverty has continued to remain relatively low. The figures indicate 4.78 percent of Venezuelans now live in extreme poverty – down from 4.9 percent in November 2015, and less than half the rate in 1998. This figure indicates the poorest Venezuelans aren’t bearing the brunt of the downturn, as soaring food prices would suggest. 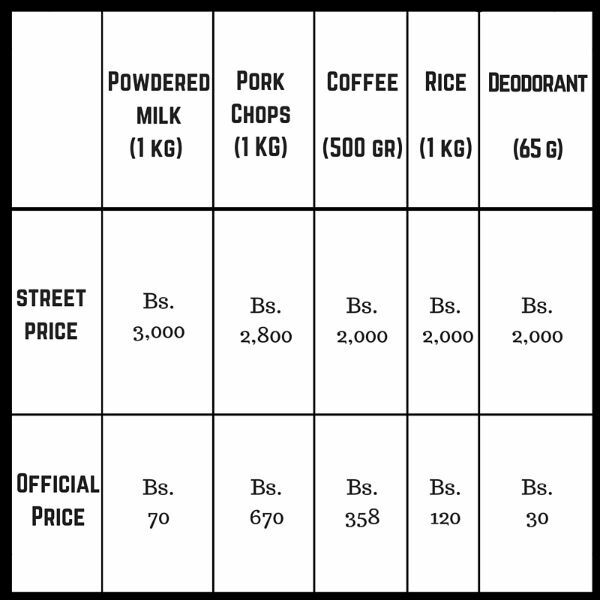 However, the picture remains incomplete, as we don’t have fresh data on purchasing power. This means it’s unclear how well impoverished (as opposed to extremely impoverished) and working class (colloquially speaking) Venezuelans are faring. For over a decade, most Venezuelans have enjoyed a steady rise in purchasing power for basic goods. However, if inflation continues to soar while wages struggle to keep up, purchasing power could go down the drain, and we may eventually see poverty figures rise. For now though, it at least appears Chavista social missions are not only keeping the country from slipping into extreme poverty, but actually modestly decreasing extreme poverty. In times like these, this in itself is a notable achievement. 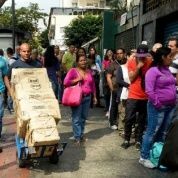 In another of our articles on the alleged hunger in Venezuela, teleSUR’s Iain Bruce looks at some of the underlying causes of the shortages the country is suffering. This week, the Venezuelan government began raising the controlled prices of several essential food items and other basic goods. The aim is to make it’s more worthwhile for producers, wholesalers or retailers to sell them, and thereby reduce the incentive to hoard them or divert them onto the parallel, informal market where they go for many times their official price. Is There Hunger in Venezuela? The Venezuelan opposition’s parliamentary report on the food situation in the country – the one it drew up to back its claim that there is a humanitarian crisis and seek international intervention – has a fairly simple argument to explain the shortages. The Bolivarian government allowed domestic production to collapse and relied too much on imports. Now it has less dollars to import with, that problem has turned into a crisis. Its very obvious that price controls and currency controls are the main problem. 1USD=1100 bolivares on the open market. That means that a deodorant is sold for around 3,30 US cents. What would happen in Romania if there was state shops selling products at that price? Would people resell it at the same price in Obor? Pe scurt, ce conteaza ca in Venezuela persoane statistic non-sarace fac foamea… Conteaza cu adevarat doar ca inima lui Chavez era in the right place. In rest, vor exista intotdeauna vulturi capitalisti care dau tarcoale – ca sa citez articolul -, numai buni sa exonereze stanga revolutionara de orice dezastru. Ce ar fi daca ati cere i formatii si de la ambasada Venezuelei? Ca presa noastra guita de placere. Asa le trebuie comunistilor! Toata lumea maninca rahat si se gasira ei in Venezuela a faca pe nebunii ca nu le place…. Maduro e de vină pentru criza din Venezuela ; și doctrina chavistă e de vină pentru rata imensă a criminalității. Maduro, în cinci ani, a reușit să ducă Venezuela la sărăcia Cubei. Prețurile impuse de stat, care au dus la raționalizare (și apoi la dispariția alimentelor) repetă odioasa sărăcie din perioada lui Ceaușescu. Să nu mai înecăm peștele. Maduro a reușit, prin raționalizare, să închidă și ultima fabrică de bere din Venezuela. În Venezuela nu mai e bere. Să nu-i mai găsim circumstanțe atenuante lui Maduro.